Content Marketing (in it’s simplest form) is creating content that attracts visitors to your website. For a website owner, having a regularly updated blog can be your best route to the top of the Google rankings, as Google will automatically place your website higher than your competitor who has a static website that never changes. In this post I will explain how to get high Google rankings through content marketing. Firstly, let me explain the layout of Google’s search engine results page (SERP). The screenshot above shows a typical Google search results page for a common type of search <service> + <town>. Paid Google ads – these show on the top and right side of the Google search engine results page. With pay per click ads, you buy your way to the first page of Google. You pick the keywords you want to bid on, write your details (headline, web address and short description) and your ad will display. Every time someone clicks on your ad, you pay Google. 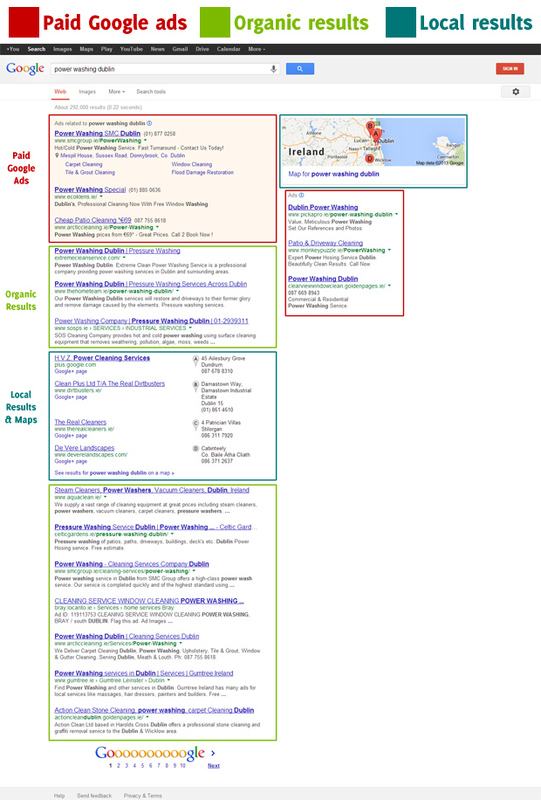 Organic search results – these are the natural results that Google has always displayed. These feature the websites that Google deems most relevant to the users search term. These attract more user clicks than the paid search results and so are the best place to have your site listed. Local search results – depending on the user’s location and search term used, Google will sometimes integrate local results (and location maps) into the organic results. These results are largely based on your physical location and how close it is to the location of the searcher. You setup and optimise this listing by signing up for a Google Places for Business, allowing your business to be found on Google Search, Maps, Google+ and mobile devices. If you regularly add unique, expertise-based content (focused on your niche) to your website, then search engine optimisation (SEO) will become easy. Many moons ago, people (self-titled “SEO experts”) used a variety of deceitful techniques to trick Google into showing their website at the top of search results – keyword stuffing, buying backlinks etc. As Google is constantly changing and refining its formula, it is becoming more intelligent and better equipped to not only detect tricks, but punish tricksters (sometimes severely). My advice to website owners who want high Google rankings is to concentrate on creating compelling content related to their niche, rather than hoping a trick that worked yesteryear is future-proof in Google’s eyes. Whilst content marketing is time-consuming, it is also worthwhile and can be seen as your long-term free advertising targeting your potential customers indefinitely. The content you are going to create is most likely what you already tells clients in person or by phone and don’t forget – you know your product or service and why it’s better than the competition – your blog gives you a voice to broadcast this. When researching what content to create, you need to think like a searcher. Let’s pretend I own a hotel in Dublin. 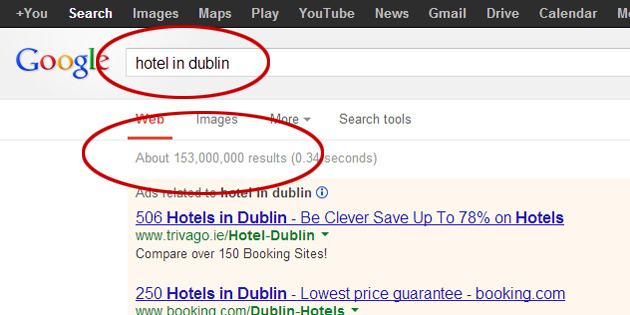 If I search for “hotel in Dublin”, as you see below Google is telling me there are more than 150 million websites relevant to that search term. Due to the amount of competition, it is going to be quite difficult ranking on page 1 for that particular term. Now, if one of my hotel’s unique selling points was my location (let’s pretend we’re parked right next door to Dublin Zoo), I might further refine my search to something like “hotel near Dublin Zoo”. This term returns almost 150 thousand results, in turn giving us a more realistic chance of landing on Google’s first page. Now that we have the term we want to get found for, I will show you in steps, what to do to start ranking for that term. Using Google’s keyword planner, we will input our term and learn the number of times our term is being searched for and the level of competition for that term. The ideal combination here is of course high volume, low competition. Following our keyword research, we will create a new blog post focusing on or keyword. Using great on-site SEO, we will include our keyword in the places Google expects to find it (these are listed below). We will also make it easy for our visitors to share our post by including social media buttons. Having created our post, we will share it on our favourite social media sites like Google+, Twitter and Facebook, in order to both announce that the new post exists and send some traffic to it. Backlinks are basically links on external websites which point back to our website. In step 3, we got our first backlinks to our new content from some of the social media giants. Google almost sees backlinks as votes, so the more quality backlinks we can get, the better. I cannot stress “quality backlinks” enough – always ask yourself is the site linking to me related to my industry. E.g. in this case a backlink from the Irish Hotels Federation is obviously going to be more beneficial to me than a link from the Irish Internet Association. There are many ways we can promote our post and a simple Google search will return many ideas more than I am going to list here as this has already become a longer post than intended but if you have read this far, thank you for your patience! 2 very quick and easy ways to promote your content immediately and continuously, is to seek out other related blogs and forums, and leave expertise-based comments. This will help raise your profile in your niche and also will get you more backlinks to your website. If you have done this much and continue to do it regularly, well done you, but your potential customer is only half the audience you need to create content for – the other half being Google of course! Think like a searcher and use your keywords throughout the site. 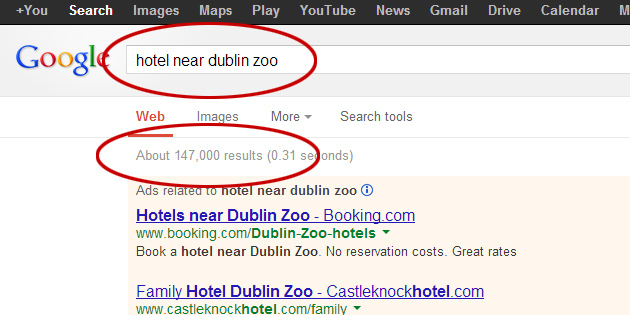 You won’t be found for “hotel near Dublin Zoo” if that phrase doesn’t appear anywhere on your site! Just be careful not to cram keywords in, make sure everything reads natural for your visitors. Mix keywords with formulas that work when it comes to giving titles to your posts. E.g. answering common client questions is a great way to create fresh new content, offering “how to” guides is another. www.myhotel.com/?p=#963 and makes it easier for Google to understand the topic of the page. Use header tags to further inform Google of what the post is about. For example, the title of this post is “Get High Google Rankings Through Content Marketing” and 2 of my headings within the post are “Content Marketing Examples” and “Content Marketing in 5 Steps” – Google should be in no doubt what this post is about. Whilst not likely to affect search rankings – including your keywords in your meta description might convince a searcher to click through to your site rather than your competition. Your meta description is the 150 or so characters used below your post title in Google’s search results page. Google cannot read your photos and so relies on their alt tags to get an idea as to what they are about. Including your keywords (as always naturally and not just stuffing them in there) not only tells Google what your photo is about but also gives you a chance of showing up in Google Image search results. Now you know how to create the content your potential visitors are searching for and structure it so that Google displays it high on it’s search results pages – it’s time for you to get content marketing for your own website. If this article inspired you to create a new blog post, feel free to let me know and I might just take a read and share it for you on some of my social networks.